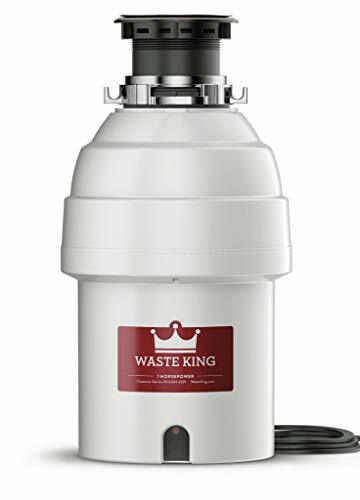 The Waste King L-8000 is a powerful garbage disposal that can easily break up your food waste, it's reasonably priced and has an amazing warranty. Buying a garbage disposal is an eco-friendly investment for your home, and finding the right one to meet your needs is an important decision. 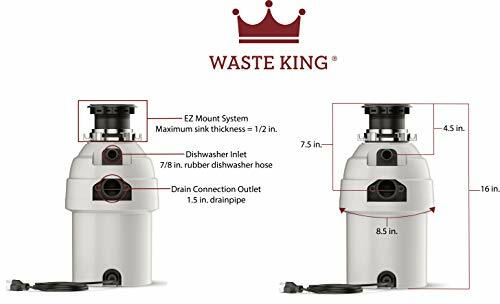 We'll take a deep dive into Waste King's L-8000 garbage disposal to help you determine if this is the disposal for you. The affordable price and sheer force this unit delivers should have the L-8000 on your short list. Why The Waste King L-8000? The Waste King L-8000 features a 1-horsepower (hp) motor that packs enough punch to go toe-to-toe with the most powerful garbage disposals on the market today. Yet, it's available for a fraction of the price of many other 1-hp disposals. This in-depth review will cover what features the L-8000 offers in combination with its high-powered VORTEX™ motor, and discuss whether those features should be enough to sway your buying decisions toward one of Waste King's top units. Garbage disposals with a large 1-hp motor are typically only needed in households that have a significant amount of food waste. The Waste King L-8000 is no exception. It's built to handle the challenges that come with feeding a large family or big family gatherings, without clogging or jamming. But what sets this 1-hp garbage disposal apart from so many others is the price. The relatively low price of the L-8000 makes this the perfect garbage disposal option for a homeowner looking for affordability. The frequently lower-than-average price for such a powerful disposal also makes it a great choice for a rental unit with a large number of tenants where you many not be able to keep an eye on it all the time. This hard-working garbage disposal is all about getting the job done. It's no-nonsense exterior is pleasant, but not something you'll likely be showing off to your friends. But how often have you done that anyway? A garbage disposal is made to grind up food waste quickly and quietly, and the Waste King L-8000 not only do that, but it does it well. Value - You'll be hard pressed to find a 1-hp garbage disposal with better value. The price is typically well below other 1-hp disposals. Easy Installation - The manufacturer has taken extra steps to make installation an accessible DIY project. In most cases, all you'll need is a screwdriver, adjustable wrench, hammer, and a bit of plumber's putty. Power Cord Included - Waste King even includes a power cord! No need to make multiple trips to the hardware store, or "steal" it off your old disposal. Lightweight - Weighing in at less than 12 pounds, the L-8000 is easy to position under the sink. Warranty - Waste King provides a 20-year limited warranty for the L-8000. Which is one of the best warrantys around! Jams Must Be Cleared From Inside - Waste King recommends inserting a broom handle into the grind chamber to loosen jams. Although, this method certainly works, and many think it's easier, the neatness of inserting a jam wrench underneath the unit to help free the jam is hard to beat. Considerably Large - Before you decide to buy this disposal, get your tape measure to make sure you'll have space. The L-8000 measures 16-inches from where it's mounted at the bottom of the sink. If you have limited space or a deeper sink, this disposal just may not work for you. 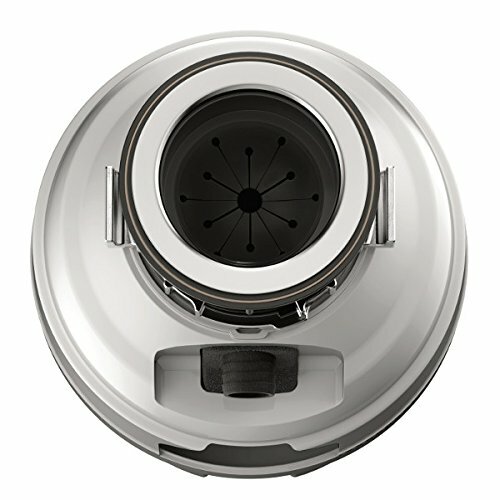 The Waste King Legend-8000 is the most powerful garbage disposal in the company's residential line-up. It may not have all the bells-and-whistles as some of the other 1-hp disposals on the market, but this unit is designed to get the job done and get it done for many worry-free years. The Waste King L-8000's 1-hp motor runs at the high speed of 2800 RPM in order to grind food waste quickly and efficiently. Thus, reducing the amount of electricity and water needed, and saving you money. The permanent magnet technology allows the VORTEX™motor to reach full speed as soon as you turn it on. This reduces jamming when the L-8000 is tasked with breaking down hard to dispose of foods. On the rare occasion that the L-8000 does jam, the disposal automatically powers off to prevent the motor from overloading. The manual reset button is conveniently located on the front of the unit, yet its tucked safely away so it won't be inadvertently pressed. The Waste King L-8000's EZ Mount system allows for a quick and easy installation. The twist-and-lock design allows you to have your new disposal in place so you can begin grinding up food waste in no time. But, if you're more comfortable with the 3-Bolt Mount, then you should purchase the Waste King 9980. It's the same unit, only it uses the Pro 3-Bolt Mount, which is a little more challenging to install, but very sturdy and durable. Unlike many of its competitors, the Waste King L-8000 comes equipped with a pre-installed power cord. This means that you won't need to purchase a separate power cord kit or use the cord from your old disposal. You can easily remove the pre-installed power cord if your decide to hardwire your disposal. However, check the codes before you make this change, because in many areas the building codes do not allow for hardwired garbage disposals. If your previous garbage disposal is hardwired, you may want to consider adding an electrical outlet under your sink. 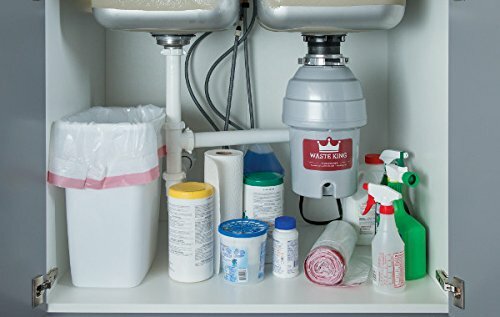 This guide will give you step-by-step instructions on how to install an under-sink outlet for your new Waste King L-8000. Garbage disposals can be noisy. One of the things you should consider before making a buying decision is the noise output. The L-8000 is lined with insulation which deadens the sound and allows it run very quietly. The SoundSHIELDTM technology has helped the Waste King L-8000 become one of our favorite quiet garbage disposals! Read our complete article to learn more. A 20-year warranty for a kitchen appliance is unheard-of these days. Although, Waste King is so confident this product will last, they'll replace any unit that develops a mechanical or material defect for two full decades. You might be asking yourself how a company can offer a 20-year warranty on a garbage disposal. Well, the answer to that question is in the grind chamber. The grind chamber of the L-8000 is lined with reinforced polymer to prevent corrosion. In addition, the disposal utilizes stainless steel grind components which won't rust. Stainless steel is considered the gold standard when it comes to grind chamber materials. Selecting the right size motor for your garbage disposal is critical, but the abuse that occurs within the grind chamber makes this area of particular importance. Read more on the topic in our Garbage Disposal Buyers Guide. As mentioned earlier, the Waste King L-8000 is a tall unit. From top to bottom, the disposal measures in at 16-inches, so you might find it interesting that we consider it to be compact. But the slim and trim design, means you'll have plenty of room under your sink to store your cleaning supplies, and since its lightweight (less than 12 lbs) you should be able to easily lift it into place during installation. The neoprene splash guard will keep water and food waste from splashing around while the L-8000 is busy grinding. Since the splash guard is removable, it's easy to clean, and you'll be able to retrieve any items that accidentally fall into the hopper. If you have a septic system, you won't need to worry. The Waste King L-8000 is safe to use. Just be sure your septic system is properly sized. Read our garbage disposal buyers guide to learn more. The Waste King L-8000 is the perfect garbage disposal option for a household that doesn't want to spend top-dollar to process large amounts of food waste. The unit is affordable, durable, reliable, and above average for the price. If you're looking for a fancy disposal with the most advanced features and cutting edge technologies, this is not the garbage disposal for you. 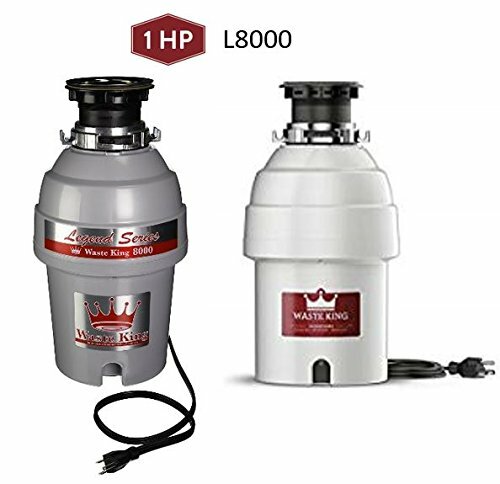 However, if you're looking for an affordable, no-frills garbage disposal that gets the job done, the Waste King L-8000 is an excellent choice. Whether you're looking for a Waste King that isn't as powerful as the L-8000, or you want something more compact. Or maybe you simply want all the bells-and-whistles, take a look at some other options that may be a better fit for you. The Waste King L-3300 is a favorite among users, and the 3/4-hp has plenty of power. The Waste King L-2600 is a solid performing 1/2-hp garbage disposal. It's more than capable of getting the job done, especially when the job just isn't that big. The InSinkErator Evolution Excel may be the best garbage disposal on the market today. It packs a 1-hp motor and has all the bells-and-whistles you'd expect. Read our full review. The InSinkErator Evolution Compact is a great alternative if your kitchen can't accommodate the height of the Waste King L-8000. It measures only 12-inches high, rather than 16-inches.